I've been getting emails asking if I'm okay because I haven't written, so I thought I'd better write a quick post. I'm fine! Life is just really boring right now, and I don't really have anything to write about. I feel redundant when I post about my running, even though that's what I enjoy writing about the most. I really need to come up with another goal, and I've been thinking a lot about it. Without a goal, I feel kind of lost--like I'm running a race with no finish line. I'm still not interested in any distances longer than a 10K, so I was thinking of setting a 5K goal for the fall. My current PR is 24:51, but I think I am capable of running about 23:45 right now. So, I was thinking I may try to aim for sub-23:00 in the fall. It sounds totally crazy! But so did a 10K PR last year, when I set the goal, and I did it. 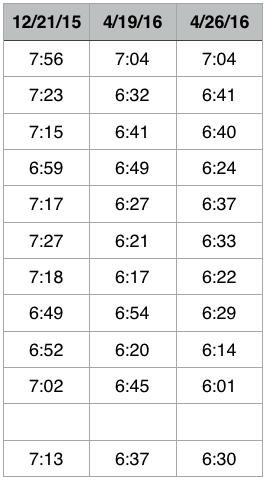 (These are the race time equivalents based on my 10K time.) 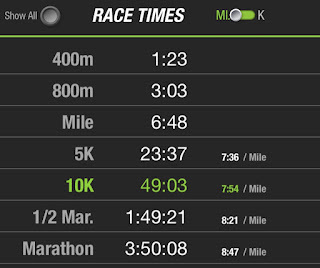 The half-marathon time prediction is 1:49:21, which is tempting to try! A sub-1:50 goal was on my radar for a couple of years after I ran my PR race of 1:52. But I really don't want to run any halfs in the foreseeable future, so that goal is out. 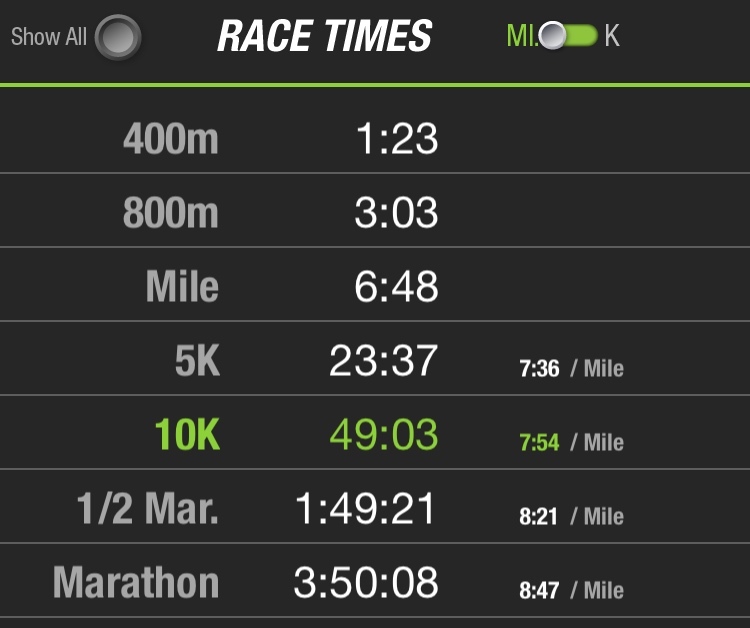 But seeing these predictions makes me think that if I work on it, I could probably run a sub-23:00 5K in the fall. Anyway, I did speed work today, same workout as last week: 10 x 45 sec. It went much smoother now that my heart rate monitor is working! I ran a 10-minute warm-up, and then did the 45-second intervals. 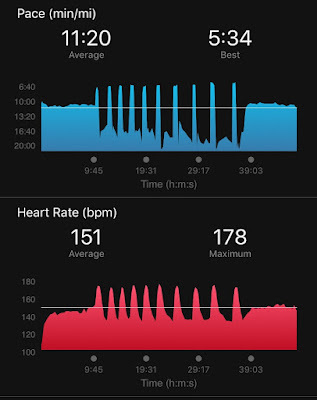 Between intervals, I walked slowly to bring my heart rate down to 136 bpm. Once it hit 136, then the next interval would start. 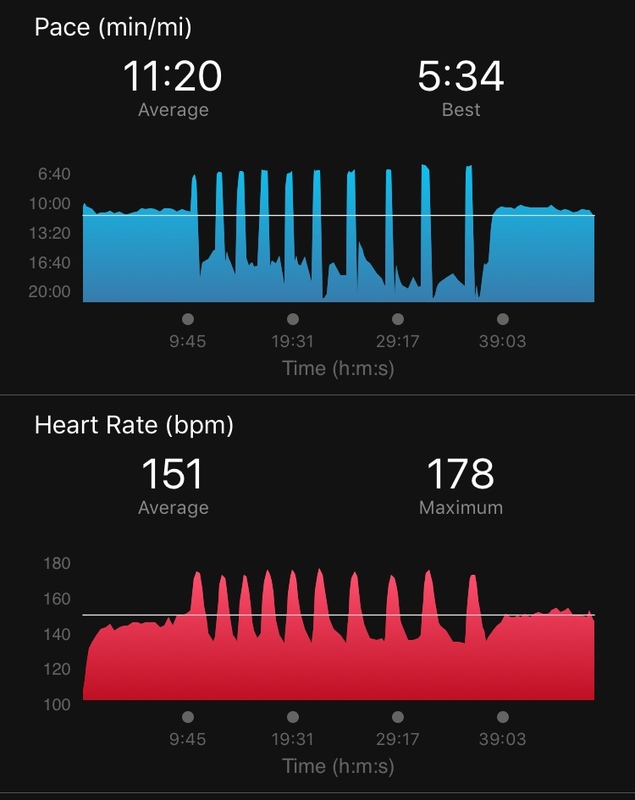 It's interesting to see that the further I got into the workout, the longer it took to recover from each interval. Other than the running stuff, my week has been pretty terrible as far as my motivation. I'll write more about it tomorrow on my Wednesday Weigh-in post (spoiler--the scale will most likely show a gain this week). I haven't binged, but this whole week I've felt totally unmotivated to get anything done, and it has made me realize that I need to set a new running goal. It was my 10K goal that kept me focused all winter, and like I said, I feel kind of lost without a goal right now. Anyway, I'm here, I'm alive, everything is fine :) I'll write more tomorrow! Your post was interesting. When I train hard and meet a goal, I am elated that day. And maybe the day after. But I find it turns quickly to feeling lost, and sort of let down...feeling that way always seems strange, since everything went great, just as I hoped. I think it's because I spent so much time totally focused on the goal and I really enjoy committing myself in that way--the training, the anticipation, the excitement. When it's done, it's gone. And then I feel lost for a while until I figure out what I'm going to do next. The first couple of times it happened it was confusing. Now that I know it's coming, it's easier to ride it out. I hope this makes sense. You did an awesome job on the 10k and it was super fun rooting for you 'from the sidelines'. I was so happy you made your goal--you worked so hard! I get the goal thing. I've been training for a century since January (a metric century, 100 km on my bike) and completed it April 9. That was huge, but since then, I've had a rather "what do I do now?" feeling. I'm currently debating starting C25K while I keep up my biking fitness, but maybe I'll train for an imperial century (so 100 miles) instead. I get bored easily, too, and the goals help me stay focused. I have a half on Saturdsy, and I think I'm taking a break from those as well. It worries me too. I feel like I need a purpose to run. You mentioned on FB about a summer weight loss challenge. Is that still in the works? Maybe you could try setting a biking goal instead of a running goal to completely change things up? I love that idea! I'm going to think more about it. I totally feel you! After years of having goals to motivate me, it's a necessity these days. I don't know who I am when I don't have a goal to work toward. I'll be honest I was a little worried about the lack of blog posts, but I knwe you were okay, just working hard on the Wednesday Weigh In group and the new Summer Challenge. So grateful to you for starting and handling this, it has sure got me motivated. My son and I even joined WW online yesterday and are managing to figure out the "points" system. My last membership in WW, was back in the early 80's, so it's been a while. There was no Points back then. Plus the scale, this morning for Wednesday Weigh-In showed a major loss after 5 weeks of weighing in around 186, this morning 181.4. So thrilled to finally be losing again! Thanks Katie!! !